Proceed to Mount Kenya National Park for the next two nights. 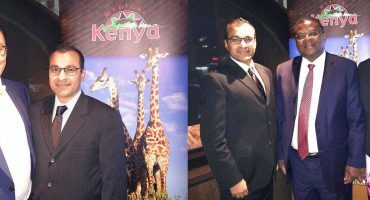 Celebrating Kenya’s iconic landmark, Mount Kenya offers a distinct highlands safari in central Kenya to the discerning AfricanMecca guest. Whether you are traveling alone, with a special someone, with a group or your family, the park is fascinating, majestic and glorious. Within the frontiers is a stunning variety of ecosystems that begin at the lower foothills and extend to the peak at 5199 meters. At the base are semi-arid plains that gradually transition to mountain forests, moorlands and glacier fields. 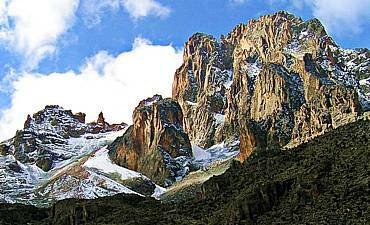 Mount Kenya is internationally recognized as an exceptional example of an equatorial mountain. Beyond the global environmental value of Mount Kenya, the extinct volcano is the national icon of Kenya, as well as a UNESCO World Heritage Site, a supremely protected escape for forest and lowlands wildlife and a much-desired feat for climbers who are enticed by the extreme terrain of vertical rocks and glacier summits. Flora diversity is unimaginable and sure to be a noteworthy aspect of your forest tour. White and black colobus monkeys are found in the ravines, and Sykes’ monkeys can be viewed along the tracks. 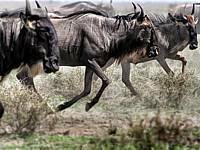 Common large herbivores include zebras on the Sirimon inclines, and buffalos and elephants are seen at times on the Naro Moru trails and in the dense bamboo forests above 2400 meters. Also at this elevations are duikers, elands and other antelopes, as well as smaller denizens, such as rock hyraxes. These fauna are joined by more common species, including defassa waterbucks, bushbucks and many more. 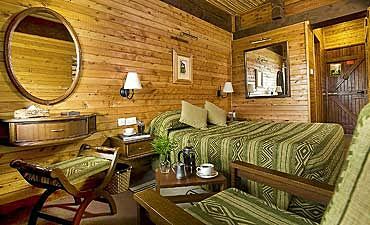 Safari Tier 3 Lodging Is Not Available In Mount Kenya. Only Safari Tier 1 & 2 Options Are Available. Spread on a terrain of beautiful, well-designed lawns on the inclines of Mount Kenya with grey crowned cranes and peacocks prancing around, the Fairmont Mount Kenya Safari Club offers you the ultimate safari retreat experience that combines relaxation and leisure with luxurious living areas, exemplary, discreet service and sumptuous food. 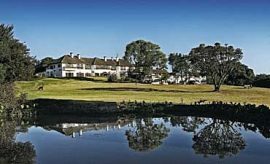 A colonial-style property covering an area of 100 acres, this hotel-like lodge has been renewed to include the necessary amenities for the discerning AfricanMecca guest traveling in the Mount Kenya wilderness. Founded by William Holden, the lodge has had a long list of illustrious visitors and welcomes you to join their hall of fame. They have 120 rooms, each including luxurious beds, a seating area and fireplace to warm the room. Safety deposit box, tea and coffee making arrangements, minibar, air-conditioning, clothes ironing equipment and internet services are available in the room for your use. The bathrooms come with premium add-ons, bathrobe, slippers and a hairdryer. 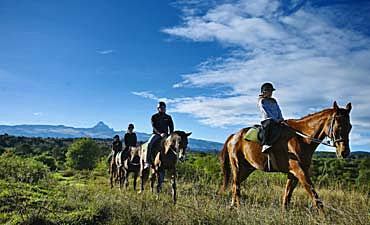 You can spend your day horse riding or exploring the locale on a nature walk in the company of a naturalist. Play a round of golf or croquet on their lawns or go bowling in the lodge's bowling alley. 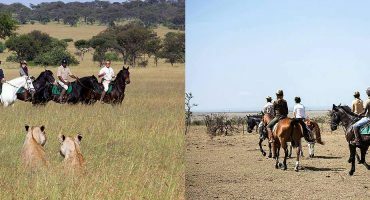 You could also spend time playing table tennis, game drive at the nearby Ol Pejeta Sweetwaters Conservancy or perhaps go on a day trek up the mountain. For guests who intend only to relax on their Nanyuki holiday on the foothills of Mount Kenya, you may dip in for a leisurely swim in the outdoor heated pool. But a must is a visit to the William Holden Animal Orphanage. Seated on equatorial deck with the panorama of the African wilderness spread below, you will have the incredible opportunity to view a veritable show unfolding before you. 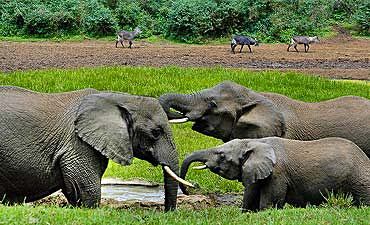 Herds of elephants and buffaloes wander into sight to drink at the waterhole and vanish into the bush. Birds like weavers, silver-cheeked hornbills, turacos, bee-eaters, Egyptian geese and many more appear almost magically and chirp while dipping into the water while monkey troupes and speckled antelopes opt for their turns. These are moments of your forest vacation in the uplands of Africa during your stay in the tranquil environs of the Serena Mountain Lodge, nestled in a woody area of the Mount Kenya National Park at a height of 2134 meters above sea level. The primary build being entirely of wood and operating on eco-friendly principles, this deluxe ark-like lodge has been constructed on high stakes and is raised above ground level up to a welcoming deck that is accessible by a drawbridge. The lodge has 41 guest cabins, each with either a glass-paneled window or a verandah overlooking the waterhole and salt lick in the clearing below. AfricanMecca guests can spend almost the entire wildlife tour of Mount Kenya watching life go by around the waterhole along with a monkey or two stopping by to visit you on your deck. 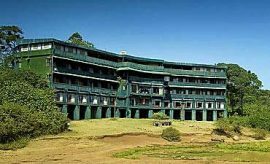 The Serena Mountain Lodge gives you the impression of living inside an old-fashioned wooden ship, in compact cabins decorated with subtle style reminiscent handicrafts of the Kikuyu tribe. 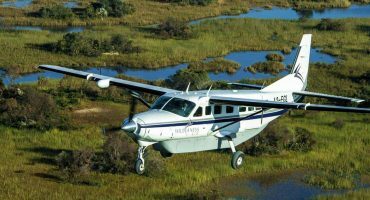 After this distinct safari, we recommend a combination off-beat extension to either Tsavo, Amboseli, Chyulu Hills, Shimba Hills or Meru in Southern and Eastern Kenya depending on your safari activity and wildlife preferences. Thereafter, harmoniously conclude with a beach rest and relaxation visit to the Eastern coast of Kenya with varied seashore, cultural and historic experiences available, including the Swahili islands and beaches of Mombasa (Diani, Galu, Tiwi, Nyali, Bamburi), Lamu, Malindi, Watamu, Kilifi, and the secluded Msambweni coast, idyllic islands of Funzi, Chale or also Zanzibar, off the coast of Tanzania. The options are endless!